After prevention, surf rescue is the second most important skill taught to surf lifesavers, and several effective techniques have been developed for successfully rescuing patients from the water. The ocean is constantly changing. To determine the best method to use in a given scenario, the lifesaver must carefully assess the prevailing conditions and risks involved. The ability to select and successfully perform the most effective rescue technique is the hallmark of an experienced and well trained lifesaver. Factors to consider include the surf conditions, equipment available, patient’s condition, and rescuer's fitness and skill. Rescues involving breaking waves can be particularly difficult and critical. At any time during the rescue, the lifesaver may signal for further assistance. The following rescue techniques are the preferred methods in use today on Australian beaches. If standard equipment is unavailable, then any floating item (bodyboard, surfboard) should be used as a rescue aid, rather than an unaided rescue attempt. Rescue tubes (with optional flippers) are usually found around the patrol shelter or at predetermined points along the beach. They may also be stored on the IRB, on the beach patrol vehicle (ATV), and may be carried by walking lifesavers on a roving patrol. Rescue tubes are flexible yellow strips of foam, approximately one metre long, attached to a long cord and a belt or harness. The cord is rolled up in a manner that allows the belt and cord to be pulled away and unrolled quickly in an emergency. In a rescue scenario, the lifesaver places the belt over their head and under one arm in a harness fashion, and then sprints to the ocean holding the tube in one hand. Once the water becomes too deep to run further, the rescuer throws the tube behind them and swims to the patient. If the rescuer wishes to use flippers they should also be worn from this point. The floating tube is then handed to the patient, who, with additional verbal reassurance from the rescuer, should quickly become less panicked. The tube can then be wrapped around and clipped securely behind the patient's back. The rescue tube is capable of floating two people. If necessary, mouth-to-mouth resuscitation may be performed on an unconscious patient, supported by the rescue tube. The rescuer then swims back to shore, towing the patient behind, or waits for additional support from a rescue board or IRB. While returning to shore, care is needed to avoid dumping waves and to protect the patient from possible spinal injury due to sandbanks and other hazards. Upon reaching the shore, the patient should be assisted or carried to dry sand and CPR or first aid commenced if necessary. Rescue boards offer a quick and reliable method of reaching patients who may be too far out to reach easily using a rescue tube. 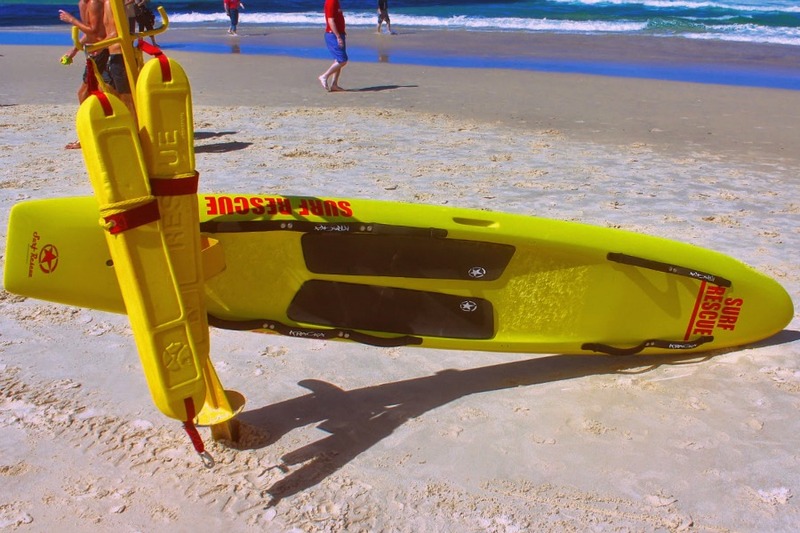 Rescue boards are large yellow foam or fibreglass boards, similar to a paddleboard, with multiple hand straps along the sides. They provide superior floatation, meaning mouth-to-mouth resuscitation can be more easily performed in the ocean, and several patients can be rescued at one time. In the case of a mass rescue, boards can keep many patients afloat until additional support arrives. Boards give the patient more confidence and reassurance than a tube, since once they're on top of the board, the patient is no longer submerged. They also allow for a much faster return to shore than a rescue tube. Like tubes, boards are usually located around the patrol shelter and at predetermined points along the beach. They're too heavy to be carried around by individual lifesavers on a roving patrol, but there will often be a board on the roof of the beach patrol vehicle (ATV). In a rescue scenario, the lifesaver grabs the nearest board and sprints to the water, jumping onto the board and paddling to the patient. Techniques such as popping and rolling are used to negotiate breaking waves on the way out. The rescuer approaches the patient from the beach side, so that the rescuer can keep an eye on incoming waves, and to ensure incoming waves don't drive the board onto the patient. The rescuer then sits up towards the rear of the board, asks the patient to grab the hand straps, and helps the patient climb onto the front of the board. The patient then lies face down towards the front of the board, and the lifesaver lies down on top of the patient and slightly further back (between the patient's legs), thus securing the patient to the board. If the patient is unconscious then the rescuer must roll the patient onto the board, and various techniques are taught to accomplish this (refer to the video to the right). The rescuer then paddles towards shore. The patient may assist with paddling if able. While returning to shore, the lifesaver must remain in control and take care not to catch any steep or unbroken waves, lest the board and patient become separated. Experienced lifesavers will try to time their paddling to coincide with lulls (periods where no waves are breaking) or they may catch small broken waves to hasten the return to shore. If the rescuer does lose control of the board, for example by getting dumped by a large wave, then the first priority is to remain with the patient, rather than attempting to retrieve the board, which would have been quickly pushed all the way to shore by breaking waves at a much faster rate than the rescuer can swim. Upon reaching the shore, the patient should be assisted or carried to dry sand, and CPR or first aid commenced as required. IRBs are a vital part of modern surf life saving operations, and most clubs perform more rescues using IRBs than any other technique. Skilled drivers and crew can handle an IRB in large and dangerous surf conditions. The speed, agility and carrying capacity of IRBs make them an unparalleled piece of rescue equipment. IRBs can quickly pick up patients between sets of breaking waves and return to shore safely. A skilled crew person is just as important as the driver, since it's the crewman's job to pull patients from the ocean, and to perform on-board resuscitation if needed. 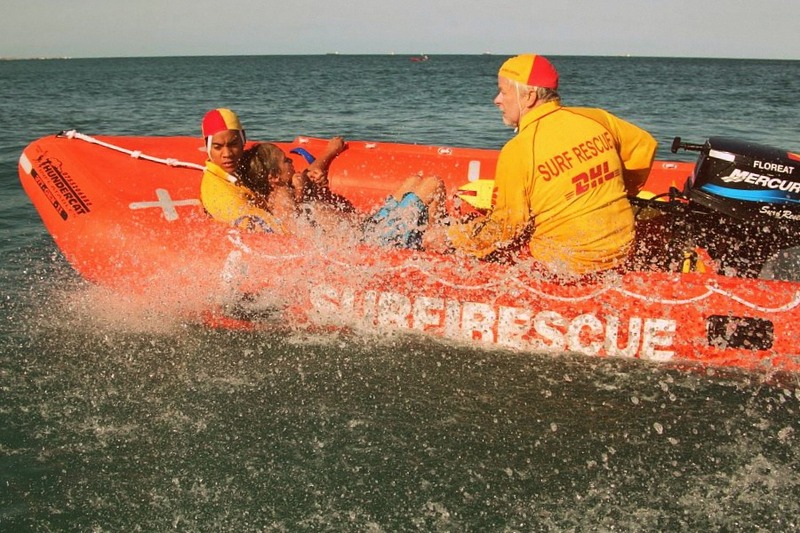 A lifesavers must undergo separate training and certification to become a qualified IRB driver or crewman, on top of the standard Bronze Medallion training. However, regular Bronze Medallion holders may assist the driver and crew with launching, beaching, pre-operation and post-operation IRB duties. IRBs are also equipped with rescue tubes for scenarios where a crew person may need to jump out and swim to the patient, for example in shallow water or close to rocks where it's too risky for the IRB to approach. 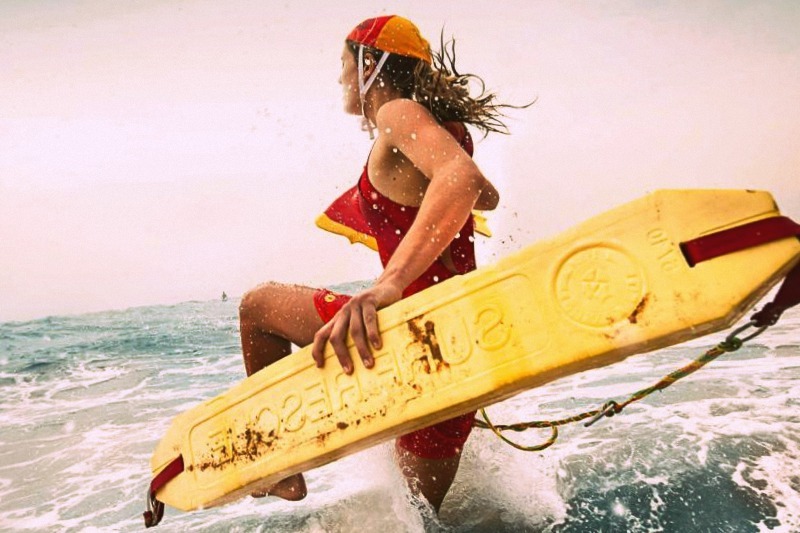 As of 1st October 2014, all surf lifesavers operating IRBs (both in frontline operations and in competition) must wear certified PFDs (Personal Floatation Devices - i.e. lifejackets). Drivers also carry a radio in a waterproof case for communication with their patrol and with Surfcom. If no equipment is available then a lifesaver may attempt an armpit tow or wrist tow. Another option is a hip carry, where the rescuer swims back to shore using a side stroke with the patient held tight to the rescuers body, supported by the rescuer's hip below the patient's back. However these methods are not as reliable as aided rescues, since they're slow and don't adequately secure the patient. They also place the lifesaver at greater risk. A mass rescue occurs when multiple patients require assistance at the same time. Such scenarios may develop when a sandbank on which beachgoers were standing is unexpectedly eroded by strong surf, washing patients into deep water. A flash rip can also result from an intense build-up of surf over a short period, creating a sudden powerful drag out to sea. Unusually strong surging waves may also engulf swimmers, and pull them out into deep water as the wave recedes. Mass rescue situations usually occur rapidly and without warning. As soon as such a scenario arises, the surf club will sound the mass rescue signal (three bursts on the siren or alarm) to warn members of the public, and to alert any lifesavers present on the beach. The Patrol Captain assumes command of the situation and co-ordinates resources. Surfcom is immediately notified and motorised rescue craft are called to the area. 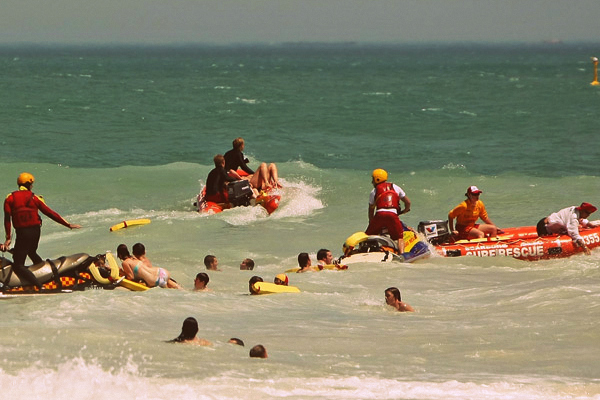 All lifesavers present on the beach must proceed to the location and assist with the rescue. The largest ever mass surf rescue in Australia's history occurred in 1938, when hundreds of swimmers were dragged out to sea by freak waves on Bondi Beach, in a tragedy that became known as Black Sunday. SLSA Support Services are another essential part of surf rescue operations. Motorised rapid response units are always on call, providing backup support 24 hours a day. The four main support craft are Rescue Water Craft, Jet Rescue Boats, Offshore Rescue Boats, and Rescue Helicopters. 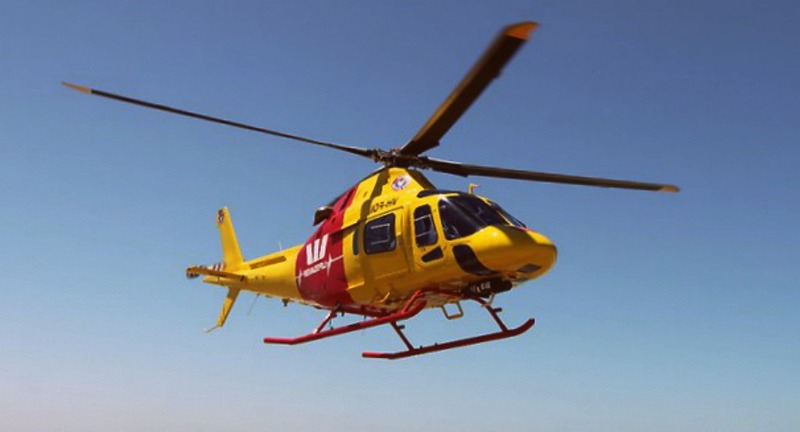 The Westpac Life Saver Rescue Helicopter Service, established in 1973, provides the ability to quickly and efficiently deliver emergency medical support to otherwise inaccessible areas.